Paramore - "What You Don't Know"
From Portland, Oregon, Paramore are the duo of Stuart Valentine on guitars, drums, and vocals, and Robin Goff on bass and fuzz bass. The two play pop rock that is always melodic, but often has a bouncy, almost danceable feel. Not much to say really. I like the songs but I think this might be a bit too mainstream for most Aural Innovations readers. The songs are all in the 2-4 minute range, though they're intended really as "songs" rather than any focus on musical development. Goff's fuzz bass often gives an underlying drone to the music that I liked, and the guitars sometimes give a crunchy aggression to the music, but for the most part you can hear plenty of music like this on your local college rock radio station. For more information you can visit the Paramore web site at: http://www.paramore.co.uk/. 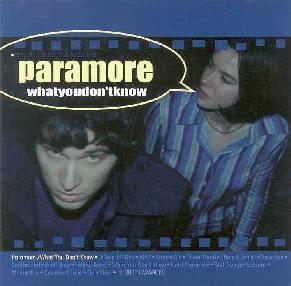 What You Don't Know is distributed by Ammonite Records. Contact via snail mail c/o Ammonite Records; Brandon Gillis; 4513 192 Ave SE; Issaquah, WA 98027.